Country meets bluegrass, meets jazz, meets classic rock- it's really New Age/Old Time music, with "chant rapgrass" and "plunk rock" thrown in to boot. The debut album of "Uncle Eddie & Robin"!! WHEELING One of the Ohio Valley's most dynamic musical dous brings a unique mix of ingredients and years of individual experience to their act, but this past weekend, they released their very first collaborative recording. The chemistry between Robin and Ed Mahonen is apparent on many levels. For one, they are a husband and wife team that harnesses decades of their two distinctive musical backgrounds which cross paths with their collaboration. They proudly stay grounded in their roots, and that pride resonates throughout their new CD, "When We're Together," which features a host of local guest musicians and song writers. Now based in Triadelphia, "Uncle Eddie" and Robin perform both locally and at select venues throughout the Midwest and Northeastern United States. "For me it has been the dream of a lifetime," Ed said of his collaboration with Robin. "She's someone I care about deeply and love to spend time with, and I think that comes through in our songs." Born and raised in a small town in Massachusetts, Ed Mahonen began his musical career in grade school with piano and later moved on to the trumpet. His musical direction changed when he picked up the banjo, which for decades now has become his trademark instrument, although he also plays guitar, bass and other instruments. After serving in the Navy in San Francisco in the 1960s, Ed spent a summer hitchhiking across Canada and the United States with his banjo slung across his back. Passing through Wheeling, he fell into a jam session with some local musicians and quickly fell into the progressive bluegrass scene. He has since been a fixture on the local scene, playing in bands such as West Virginia Grass, Castlemen's Run, Pittsburgh's Beaver Creek band and the Short Crick Flatpickers. From the early days making appearances with the Wheeling Jamboree to recent years performing to a new generation of music lovers as a member of The Recipe, Uncle Eddie has carved his name into decades musical history by way of his grassroots career. Robin is the daughter of the late Jimmy Knepper, internationally renowned jazz trombonist, and Maxine Fields Knepper, a groundbreaking jazz musician in her own right. Surrounded by jazz music since birth, Robin began playing piano at the age of 8 and picked up her first guitar at age 14. Shortly afterward, she played her first coffeehouse gig. So what happens when you bring a quirky, seasoned bluegrass man together with a girl with jazz royalty in her DNA? "When We're Together" captures that unique mix, and so does their live performances. Last weekend, Uncle Eddie and Robin celebrated the release of "When We're Together," which is available at their shows or online at www.cdbaby.com and through their Web site, www.uncleeddieandrobin.com. The CD was recorded at their home studio ELM Cottage Studios and mixed at Jamie Peck Productions. "He was fabulous to work with," Robin said of Peck, one of many locally-based music lovers who have been involved in the project. "He has a great personality, and he really helped take it up a notch." "When We're Together" boasts 11 original songs, four of which were penned by Ed and Robin. One song, "One Eye Laugh," written by Ed himself, also appears on The Recipe's last album and is a recognizable selection that has been performed live on the jam scene over the past few years. A number of the other tunes from the new release were written by friends and local musicians. The disc opens with a rendition of "Smell the Flowers" by Wheeling's own "Smilin' Joe" Smith. The CD also includes songs by Steve Gornick, Courtney Lynn Braunlich, Randy Keener and Bettina Makley. In the studio, Uncle Eddie and Robin recruited some of the area's best musicians. Virginia-based guitar and mandolin duo Herb Manila and Michael Hanson of Herb and Hanson contribute their skills on the new album. Although Herb and Hanson aren't from the Ohio Valley, they've established a growing fan base here and are scheduled to perform at Down on Main Street in Wheeling Nov. 8. Don Decena (The Vogues) plays bass guitar on a couple of selections, J.D. Daner lends his hands on percussion on a number of tracks, Dave Lewis plays bass fiddle on several selections, and "Ras Terry" Logan mans the keyborads and djembe on a few songs. Also contributing on songs are Keener on the 12-string guitar, Mike Roeder (The Catch Blues Band) on guitars, Mike "Pit" Mozena (Kickstart) on harmonica and Robin's son Luke Rios on didgeridoo. The new "When We're Together" release also contains terrific photographs by Don Feenerty and graphic designs by Rick Palkovic. Regardless of the songs they play, Uncle Eddie and Robin put their own flavor to it. "We always try to make it our own," Ed said. "We combine all kinds of styles, from classic rock to bluegrass and jazz, but if we cover a song someone's heard before, we don't want it to sound like it does on the record. We want it to sound like us." Uncle Eddie and Robin said that during their live performances, the songs truly connect with the audience. Lyrics really hit home in many instances, and are often full of wit on one hand, and reflection on another. The couple said the musical experience tends to make people "laugh, cry and laugh again." Coming off their CD release party and returning home from a gig in Maryland this past week, Uncle Eddie and Robin will make their return to the Wheeling Jamboree this Saturday with a live studio show from the campus of West Virginia Business College. The show, which features other grassroots acts as well, will be broadcast live on 1170 WWVA beginning at 6 p.m. Saturday. Other shows this month for Uncle Eddie and Robin include the Ebbert Bros. Country Music Show at the Lincoln Center in New Martinsville, W.Va. and at Down on Main Street in Wheeling on Nov. 29. The couple encourages those who have never seen their act to come out and enjoy an evening of good music. "We do two kinds of songs," said Eddie, "songs that we wrote, and songs that we would have written if we thought of them first." And most of all, "We love to surprise people," he said. One thing is for sure, they are "not your typical old folkies." "One Eye Laugh" has received Honorable Mention in the 3rd Annual Peacedriven Songwriting Contest, 2008. The spiritual connection to fire and its renewal of the human heart and spirit. "Take Care of the Planet"
Bluesy message song. We all know we need to do it! Classic bluegrass! Just try NOT to tap your feet, and we'll send you off happy! Uncle Eddie and Robin, “Not Your Typical Old Folkies”, are a dynamic musical duet with a taste of the old and a flair for the new. Their energy belies their age, and the breadth of their life experience makes for a rich and rewarding musical evening. This husband-wife team combines their voices in stunning, tight harmonies on songs that pack a punch, and their musical chemistry and sound is unmistakable. Ed “Uncle Eddie” Mahonen, “Banjo Player, Raconteur, and All Around Old Dude” is an icon in the Appalachian music scene. His wildly imaginative banjo playing, silky vocals, and intelligent, witty songwriting make him a joy to listen to. His style incorporates elements of bluegrass and folk, which he has shaped into a unique and original blend which he terms, “plunk rock”. West Virginia’s “Graffiti” Magazine said Ed has been “…a force in West Virginia music for over thirty years”. Not just another folk 'n bluegrass musician, he applies his velvety baritone voice to his original material, and has been known to "rap" along with his more traditional renditions. Ed “Uncle Eddie” Mahonen was born and raised in a small town in Massachusetts, not your usual breeding ground for bluegrass music. He began his musical career in grade school with piano, later moving on to trumpet. But one night, he found himself at what was then called, a “hootenanny”, and was instantly drawn to the call of the banjo. Despite the derision and snickering of his high school friends and family, Ed practiced and persevered with his instrument, and has honed it to the surprising sound you hear today. He is also accomplished on guitar and bass, and dabbles with the tuba. His rich velvety baritone voice completes his presentation in bluegrass, folk, classic rock and other musical genres. After graduation, he served in the Navy in San Francisco in the 60’s, where he was influenced by the singer-songwriters and poets of the era. Following his discharge, he spent a summer hitchhiking across Canada and the US, with his banjo slung across his back. Passing through Wheeling, West Virginia, he got into a jam session with some locals and quickly fell into the young progressive bluegrass scene. Before long, he became a fixture on the local scene, with the band “West Virginia Grass”. “We were playing jamgrass in the early 70’s, before the term had been invented. We were just doing what came naturally to us.” He also made his first appearances on the legendary Wheeling Jamboree. This period culminated with his participation in the band, “Castlemen’s Run”. Throughout the 80’s, Ed played traditional bluegrass with Pittsburgh’s “Beaver Creek” band, and recorded two albums with them. Ed also played for over 30 years with “The Short Crick Flatpickers”, one of West Virginia’s bluegrass bands, touring statewide and regionally. “Uncle Eddie” was born when he was appearing in the 90’s at the Wheeling Jamboree, and did solo spots of bluegrass, novelty songs, jokes and funny stories. His easy going demeanor and booming laugh made him a favorite with his audiences. Ed met Robin, appropriately enough, at an open mike jam night which Ed hosted in Wheeling. Their chemistry was immediate. Robin is the daughter of the late Jimmy Knepper, internationally renowned jazz trombonist, and Maxine Fields Knepper, a strong independent woman who was already on the road with her trumpet at the age of 16, before anyone had ever coined the term “feminist”. Robin was listening to music in utero, and has fond memories of jam sessions lasting late into the night as she drifted off to sleep as a little girl. Her early musical influences were shaped by some of the most influential jazz artists of the day. She played piano at age 8, picked up her first guitar at age 14, and played her first coffeehouses shortly thereafter. After a brief hiatus of twenty years from music while she raised her four children as a single mother, and pursued a career as a social worker in private practice, she returns to the music scene with a vengeance. She brings her born and bred musical ability and her deep understanding of pathos and the human condition to her every note she sings. Imagine: a bluegrass banjo player, and the daughter of a legendary jazz musician- it’s unthinkable? Or is it??? More recently, Ed was associated with West Virginia’s premier jam band, “The Recipe”, and his cutting edge explorations and signature sound clearly comes through on their last CD, “Jubilee”. Joe Prichard commented on Ed’s original song, “One Eye Laugh”, which closed the CD, “Ed was able to say in one song what it took me a whole album to say.” As the Recipe’s “Uncle Eddie”, he and Robin have been a fixture at summer jam band festivals, and are much beloved by festival goers who seek them out for a pat on the back, a shared joke, and, if desired, a gentle bear hug. Ed’s latest solo work, “My Own Words”, is a compilation of ten original songs, including the often requested “West Virginia Farm”, and “Let ‘Em Eat Cake”, and the amusing, yet socially poignant “Plain White Rapper”, which leaves audiences scratching their heads. Stylistically, he is literally all over the map, and yet expertly crafts his shows to the particular taste of his listeners. 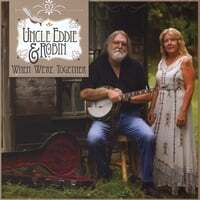 Uncle Eddie and Robin have just released their first joint CD project of all new original material, titled, "When We're Together”. The tracks range from straight bluegrass, to country, to a New Age-y sound, and even to what the couple calls, "chant rapgrass". Ed uses a variety of different types of banjos and displays several different banjo styles, and the music is interwoven and coupled with frequent instrumental guest artists and even tribal drumming on several tracks. They also operate a recording studio, ELM Cottage Studio, out of their home, and are available to help aspiring young musicians produce their own original music. Uncle Eddie and Robin have appeared this past year at The Wheeling Jamboree, Nelson Ledges, The Highland Jam at Pegasus Farm, among numerous local venues. An evening with Uncle Eddie and Robin is like sitting down with old friends. Kick off your shoes, put up your feet, and open yourself to a musical experience which will make you laugh and cry, and laugh again. fun and upbeat, this is a perfect CD for keeping you going while doing chores, and one that has lots of delightful and unique songs. Worth every penny!